Hubs is always appreciative when I give him gift ideas of things I really want. He doesn't like to shop and it makes his life so much easier. For Mother's Day this year I requested something very specific and even sent him the link to the item and posted a copy of the page from the magazine right next to the computer monitor so he'd get it right. I wasn't taking any chances! And what did I ask for you ask? 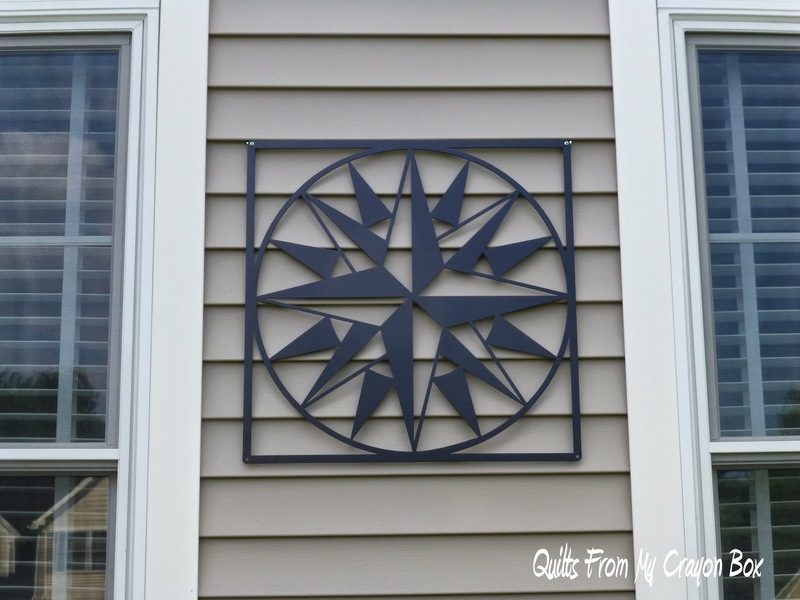 I requested this fabulous 2 foot Mariner's Compass Barn Quilt block from Classic Metal Company to adorn our house. I love it, I love it, I love it!!! It hangs perfectly between the 2 office windows and now there is no doubt at which house in our neighborhood the quilter lives. But hubby surprised me that day and not only did I receive the Mariner's Compass Barn Quilt but I also received this 2 foot Americana Star Barn Quilt. Hubs hung this one between the garage windows (we have a side load garage) but now that it has been up for a number of weeks I'm thinking that it isn't big enough for the space and it needs to be replaced with a bigger one, either the 3 foot or 4 foot size. I'd move this one to hang between the library/playroom windows on the other side of our front door. For the replacement block, I'm strongly considering the Ohio Star or the LeMoyne Star block. My birthday is coming up in a few months ya know. I chose to request these specific Barn Quilts from Classic Metal Company because of Mark's fabulous reputation and the terrific quality of his products. I love, love, love these barn quilts. I know, I said that already. But it is true! 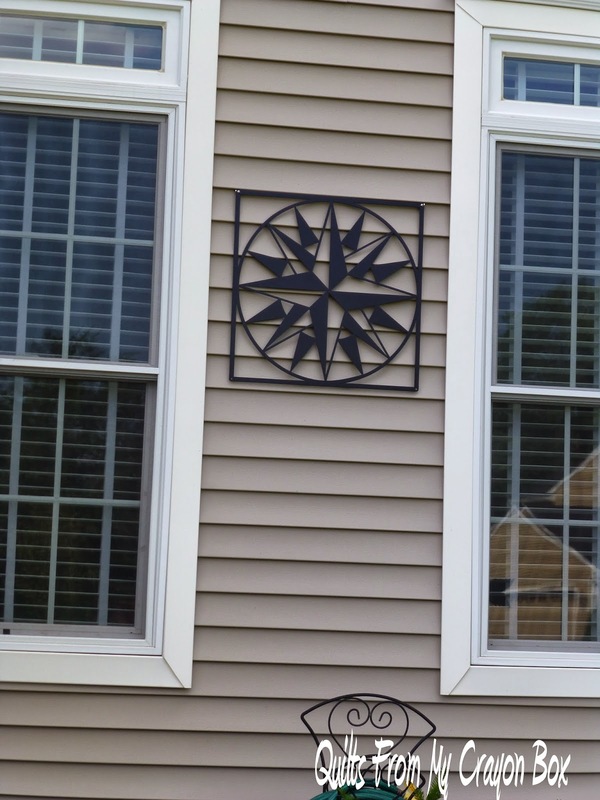 They are all made from heavy-weight steel and are all powder coated for years and years of great looks. I've seen other similar products elsewhere before and they don't measure up to these by a long shot. Not only are all of his Barn Quilts available in the standard 1 foot (12 " x 12") and 2 foot (24" x 24") sizes but he also makes them in custom 3 foot and 4 foot sizes. Plus each one is available in a number of color options: Satin Black, Navy Blue, Dark Red, Creamy White and Dark Green so there is an option to coordinate with every decor. Because I truly believe in the Made in America movement as also evidenced in my recent participation in the American Made Brand Blog Tour, I am happy to tell you that Classic Metal Company's Barn Quilts and all the hardware available to hang them are also completely made in the good ole USA. 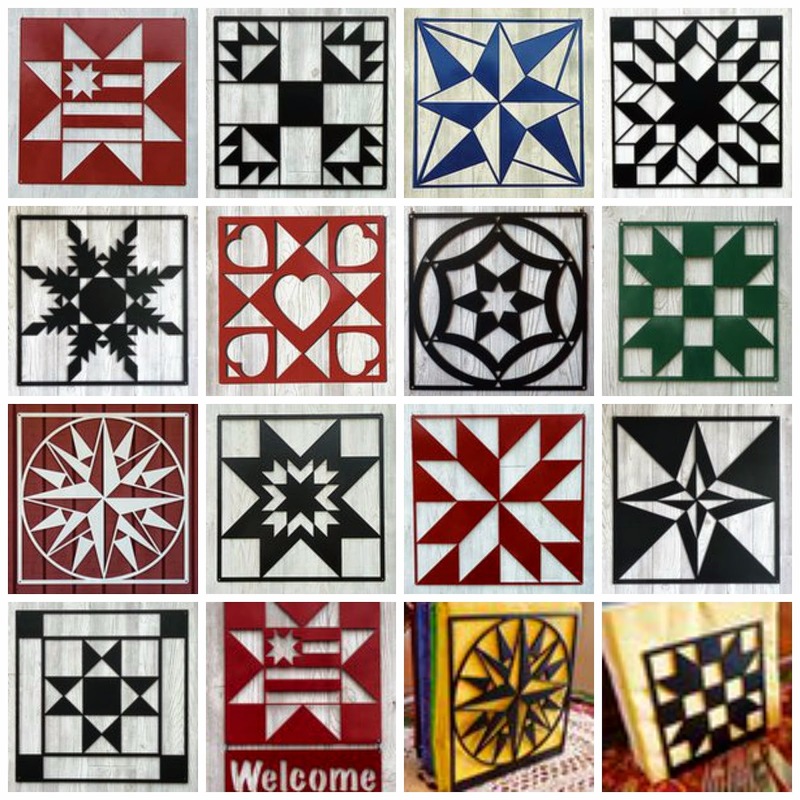 So far there are 13 Barn Quilt blocks available as well as a Greeting Sign and 2 napkin holder designs (I've already told hubby that the Black Mariner's Compass one is also on my wish list for my birthday). Just look at the wonderful options he has for you to decorate your home with, inside and out. In addition, Classic Metal Company has recently come out with (2) ruler holders which are equally fabulous. At this point in time they are available in either an American Country block or a Sister's Choice block, again in your choice of colors Red, Black or Green. And if that isn't enough, Mark also makes Barn Quilt Minis in Brass or Copper just perfect for decorating your quilting themed Christmas tree during the holidays or displaying elsewhere all year round. While recently emailing with Mark about hub's purchases and a few upcoming new design ideas he has and wanted my input on, he offered up an extremely generously and the top terrific giveaway for one of my readers. What might you win you wonder? Not only do you have a chance to win your choice of a 24" x 24" Barn Quilt in your color preference shipped directly to your home but Classic Metal Company is also including a ruler holder of your choice. So what hoops do you have to go through for your chance at these fabulous goodies? 1. 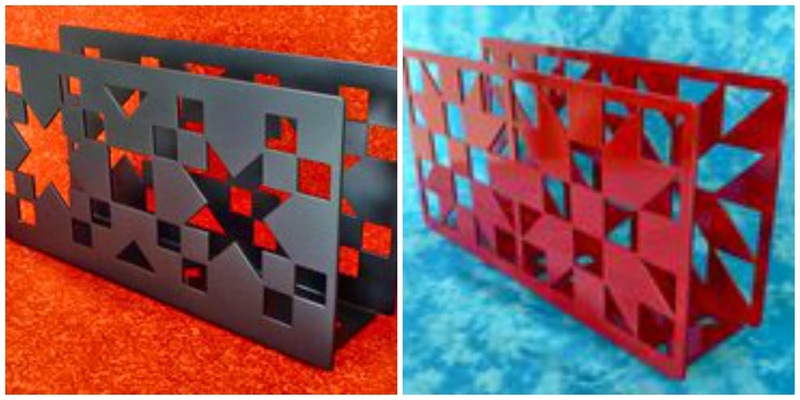 Go To Classic Metal Company's Barn Quilts page and tell me, if you are lucky enough to win, which one will you choose. 2. Like Classic Metal Company's Facebook page and come back and tell me that you did. 3. Spread the word about this giveaway on your blog and let me know about it. 4. Post about this giveaway on your Facebook page. That's it! A total of 4 chances to win. The entries will close on Saturday, July 19th at Midnight and I'll announce the winner the next day. As usual, there are always giveaway entries from No Reply Bloggers so if you are in doubt, make sure to leave your email address. Those that don't aren't even entered into the drawing. Many people still don't realize that they are in fact NRBs but if you never, ever receive replies on comments you leave on other's blogs, than that is proof that you need to fix the problem. Not everyone replies to commenters but many of us do as much as possible. Even if you don't win this time I hope that you too choose to decorate your house with one or more of these fabulous Barn Quilts. They truly are a work of art. Disclosure: While I truly appreciate the opportunity to write this review and to host this generous giveaway from Classic Metal Company, all of my opinions are my own and the offer of the giveaway items in no way influenced my comments on these products. I love Forever Yours. Easy pick, I love stars. I follow Classic Metal Company on Facebook. 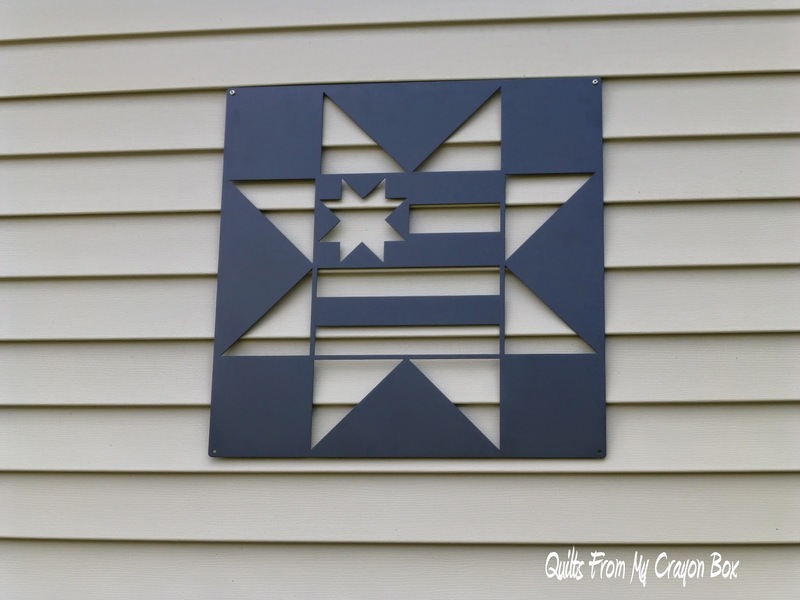 Blazing Star Quilt Block in Navy Blue would be my choice. Your quilt blocks look fabulous on your home! Wonderful gift and wonderful giveaway! Hard to choose which one, but I'm going with Bears Paw or Ohio Star. Thanks so much! How fun! I would choose Forever Yours. Oh wow! So gorgeous! I would choose Bear's Paw in black! Thank you for the opportunity to win! I would choose the Feathered Star. Those are really lovely. I am following him on FB. I already follow Classic Metal Company on Facebook. Mariner’s Compass in blue! my hubby was a captain on a towboat and loved blue! I liked their facebook page and love his work! I would pick the american star block with "Welcome" on it! WOW, these are the coolest things ever! I want the Americana, maybe with the Welcome sign!? I joined their FB page! I would love to win the Bear Paw in Navy! Our last name begins with PAW...and my husband's nickname is "Bear"! I have used a bear paw as our logo on hand made cards, etc. thanks for the chance to win! These are fabulous! I think I would love the Ohio Star. Thanks for such a generous giveaway! Hard to choose...Americana Star or Sisters Choice! Either would look great on my patio! Feathered Star in black and the American Country Ruler Holder in black would be my choices. Thank you Classic Metal Company. I would love any of them, Ohio star or any one with the hearts on it, in red if it comes that way. Hang proudly over my Scraphaus front door. Thank you so much, I dont do facebook or any thing like it. But I did tell some friends with a fwd of your email. Following you on facebook! So inspiring! Easy Peasy, I'd choose the American Star in AIR FORCE BLUE!!! 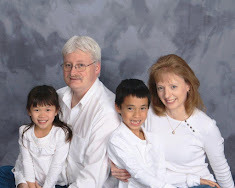 We're an Air Force family living in base housing. THIS would look fabulous on our door. xox I 'Like' on Facebook and pinned on Pinterest! Thanks so much for the chance. I would pick Sisters Choice in Red. This giveaway is perfect timing as my husband and I were talking about ordering a block to put on our house. Who knows, maybe this means I could be the lucky winner. Anyway it plays out this is the most awesome giveaway I have ever entered. Good luck everyone. Thanks for the giveaway! My choice would have to be Mariner's Compass in white. If I should be the lucky one, it would be the first "compass" that will have straight matching intersection in my quilt collection! Don't do Facebook...darn. Thanks for the opportunity for the give-away. I would pick Sisters Choice in red probably or the Ohio Star! Thanks for the giveaway! 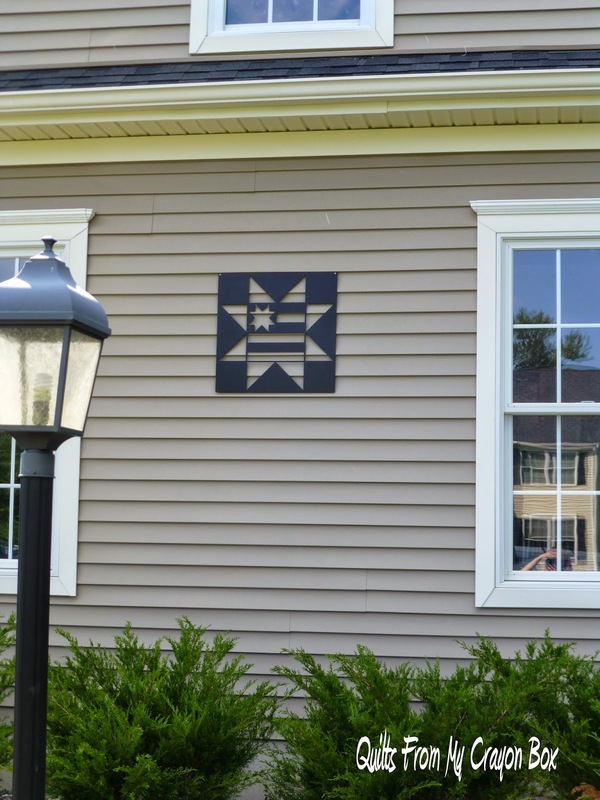 I have the perfect place already picked out to hang the Mariner's Compass in black. There is a space between our garage windows and I have tried to find something to hang there. Amazing giveaway! I would choose the Heart Star quilt block in black. I've loved these since I first saw them in Paducah several years ago! My favorite is Dutch Rose! And I shared about the giveaway on Facebook!!! Woohoo! Thanks for all the chances at such a great giveaway! I would pick the American Star in Navy Blue. I have to pick Blazing Star. They do beautiful work. Thanks for the chance. I would choose Night and Day. I love its complex simplicity! Great giveaway too! I love them all but would choose Sister's Choice. It's just so classic! I liked their site on Facebook! I love the Americana Star Quilt Block!! Liked Classic Metal Company's Facebook page: Nicole Sender! What a fabulous gift. Always nice to give little hints, to get what you want. I have been looking for one of these. I might have to give my hubby a hint on what I would like for Christmas. They are all so cute. Welcome one foot sign w/American star, I've seen these in person & they are awesome! This is the first time I have seen these and they are beautiful. I like the LeMoyne star especially. I really like the Heart Star. I have liked their FB page. I will post this on my blog, and share on my FB page. I am a quilt appreciator. My mother passed her skills on to my sister, but the gene passed me by. I love them all but I would have to choose the Ohio Star it was the first pattern I made in my beginning quilting class. Love it in blue and green. I like Classic Metal Company on Facebook. I would choose the Americana Star in creamy white! I like Classic Metal on Facebook. Mariner's Compass! It's my husband's favorite block, ever and period. So nice! 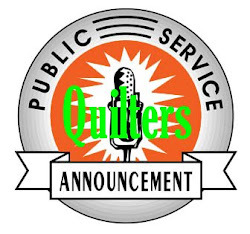 I posted a shout out on my blog - www.cherryquilt.blogspot.com - this morning! I really can't decide, but right now I think I like the Dutch Rose best. Or maybe Forever Yours... Thanks! Let's try this. Scratch the 'Sarahbeth Fairhill' as that's an old account. Still going with the flag design! Would LOVE to have that hanging on our door here on base. It would be PERFECT for us!!! :) Please let me know if this works, I honestly have no clue what I'm doing computer wise MOST of the time!!!! I don't feel as old as I actually am! HA! I love them all but if I win would like the americana star. I would choose the America Star if I won. Have always loved these metal quilt squares. If I were lucky enough to win, I would choose the Americana Star. I just love those barn signs and have a small barn that looks naked! I liked on facebook and also put it on my facebook page so I am crossing my fingers and hoping to win. I love them all! I think that I would pick the Ohio Star. It's a classic. Second entry for "liking" Classic Metal Company Barn Quilts on Facebook. I just love "Night and Day". I'd pick sisters choice in black! I love the Mariner's Compass. Being a long arm quilter, this would be perfect on my home. Wow! I am pointing my hubs to this company! It was a hard choice but I think I'd pick Mariner's Compass as my first acquisition. I think they could be addicting! I liked classic Metal Company's FB page. I just "Liked" Classic Metal Company on Facebook. My favorite block is the Feathered Star. I have the Mariners Compass and Bear Paw already and love them! Thank you for the chance to win another one! Ohhh this is a tough choice....so many great blocks. I think I would choose Dutch Rose! Thanks for such a generous giveaway! Bear's Paw because I have family who live in a community called Bear Paw! I would choose the Bears Paw in the creamy white color. Thanks for the chance. 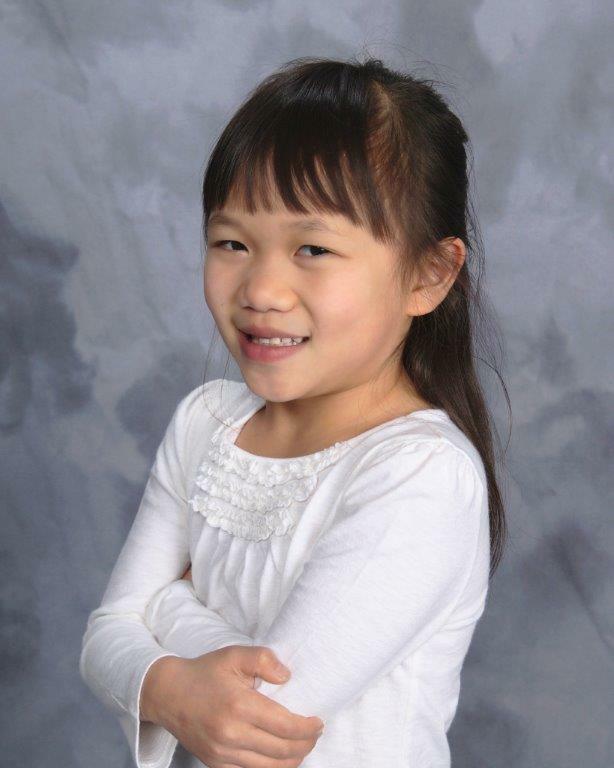 I love the Americana Star! How lovely that you and Classic Metal Company Barn Quilts are doing this! Mariner's Compass in blue--although they are all great designs! Successfully posted on my FB page. If I win, I think I would choose Night and Day. But not sure yet if I would get the black one or the red one. Decisions, decisions, decisions! I now "like" Classic Metal Company on Facebook. It is so hard, I like either the Dutch Rose or Forever Yours. So hard to choose, but I think the Feathered Star would look best in the spot I would hang it. Sorry, I don't FB. After much back and forth I finally picked Dutch Rose. I already liked them on FB. I am always happy to see another Made in USA company. Will be linking them from my blog. How could I only choose one? It would be a hard choice between the compass star and the bear paw!